Wholesaler & Trader of Projector Screen. Our product range also comprises of High End Projector, Short Throw Projector and LCD Projector. 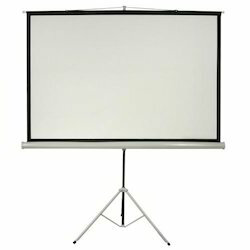 We are among the most sought after offering Projector Screen to the clients. This product is designed and manufactured using high grade raw material by authentic vendors of the market. Offered range is available in milky white or grey surfaces that are designed to support projection. Projector Screen has screen lanyard for easy operation that allow screens pull down handle to be reached from high areas.